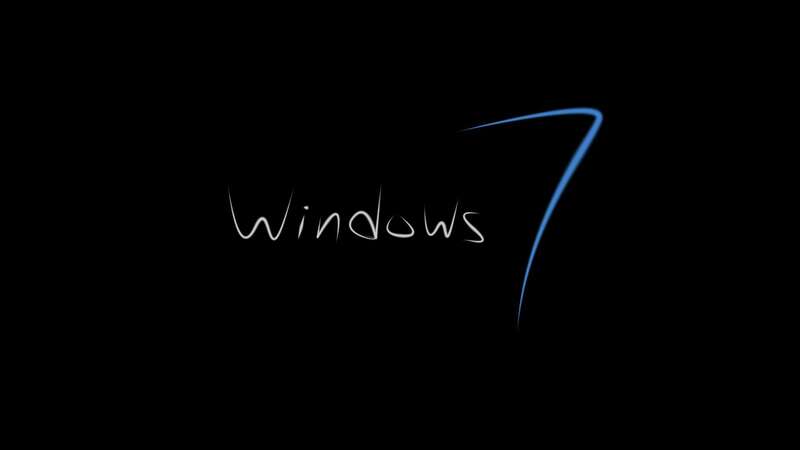 Are you having issues with getting your VPN to work with your Windows 7 PC? We have the best solutions for you. Windows users reported having the problem with the VPN not working with their Windows 7 PC. The reason for this problem varies. However, we have compiled the following fixes applicable is solving the VPN not working with Windows 7 problem. Windows users reported that limited/inactive internet connection can cause the VPN not working with Windows 7 problem. Hence, you may consider changing your Internet connection and try to use the VPN afterwards. 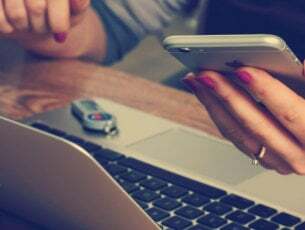 For instance, if you are using a dialup modem internet connection, then you may need to consider changing your Internet connection mode to LAN, broadband or Wi-Fi connection, or any other internet connection modes available to you. Furthermore, test your internet connection by disconnecting from the VPN service and try to access any website on your web browser to see if it works. However, if the problem persists, proceed to the next method. Windows 7 users reported that their VPN doesn’t work with their PC because of the incorrect date and time settings on your PC. Check the date and time settings to ensure they are correct. Disable automatic update of date and time using the Internet, and set the date/time parameters manually. In addition, you should also consider changing your region/location to reflect the selected server location on your VPN settings. However, if you still get the error after trying out this fix, you may proceed to the next step. 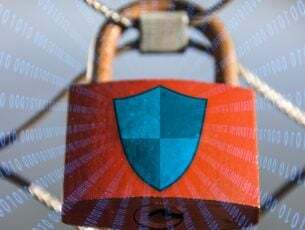 Some antivirus programs may block your VPN connection. Hence, you may need to temporarily disable your antivirus or firewall so as to be able to use it on your Windows 7 PC. However, some Antivirus programs have the “temporarily disable protection” option which you can use while others do not. 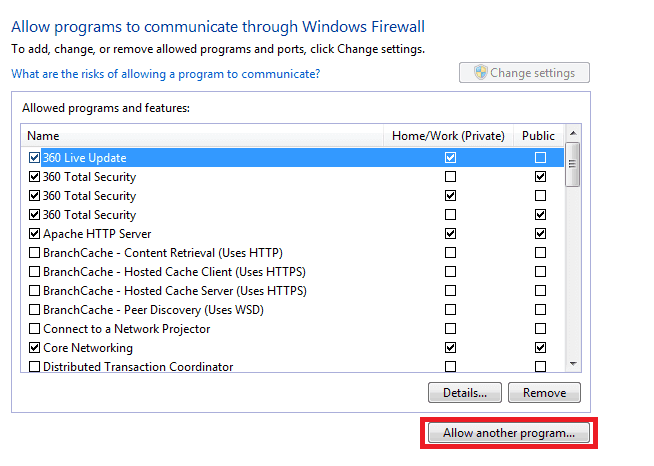 Go to Start > Type “Allow a program through Windows firewall” and then hit “Enter” key. Check if you can connect to your VPN. Note: Check your IP address for information such as your city or region (country) next to the location you selected in the VPN windows. You can use a web service such as IPLocation and WhatIsMyIPAddress to check your IP address location. However, if this does not work, proceed to the next step. Press the Windows key, type “VPN” without quotes, and then hit the “Enter” key. Now, enter the address of your VPN provider in the Internet Address box. 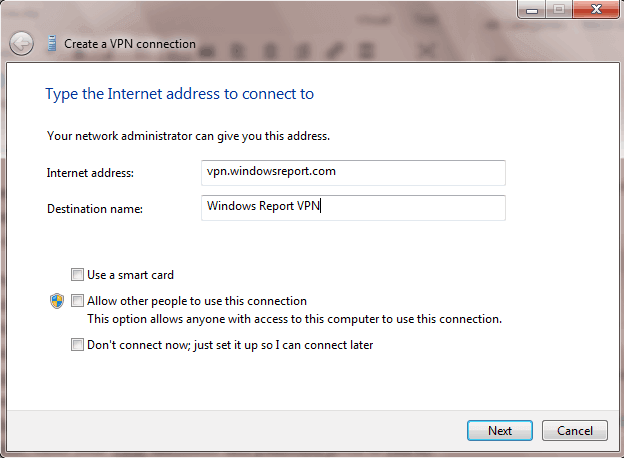 (You can enter an address like vpn.windowsreport.com or a numerical IP address, depending on the server information your VPN provider gave you. Enter a Destination name (VPN connection name). 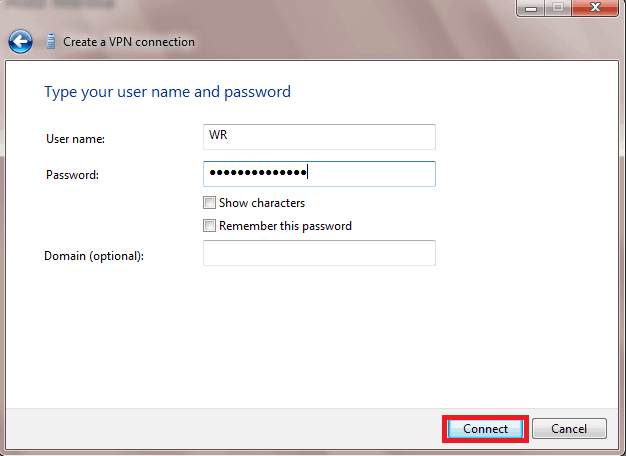 Now, enter your VPN username and password given to you by the VPN provider. Note: Furthermore, once connected, you can click the network icon in your system tray to view your VPN connections. While connected to a VPN, all your network traffic will be sent over it. You can connect add more VPN connections to your VPN connection list. Press Ctrl + Shift + Delete to access the “Clear recent history” dialog box. Under the “Time range to clear” drop-down menu, select “Everything”. Make sure to check the “Cache” box. Click on Clear Now. Note: Ctrl + Shift + Delete can also be used to clear cache on other web browsers such as Google Chrome, Internet Explorer, Opera, Microsoft Edge, etc. Go to Start > Type “Network Connections”, and press Enter. Right-click a VPN connection and use the “Delete” option. Select VPN. If you see your VPN as available, delete it. After complete uninstall, proceed to install the VPN client on your PC, and then use it afterwards. 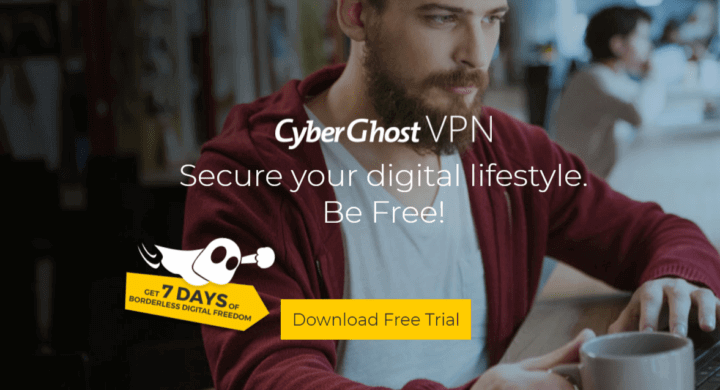 Good VPN providers like CyberGhost, NordVPN, and Hotspot Shield VPN work best with Windows 7 PC. CyberGhost has 75 servers in more than 15 countries, so you can access WWW, whether the services are blocked or not where you reside. Its Unblock Streaming feature lets you access other popular streaming services without testing servers manually. Features include hiding of IP, IP sharing as an additional security layer, and Leak Protection against IPv6 leaks, DNS, and port forwarding leaks. Once connected to the server, CyberGhost sends feedback about the website you’re connected to and want to watch, the current server location, and protection status. For more information on how to install and run CyberGhost, check out this guide. Hotspot Shield VPN not only lets you also surf anonymously, but also unlock websites, secure web sessions at hotspots, and protect your online privacy. It is one of the most trusted VPNs to use with Windows 7 with fast service, and a safer web offering as it protects your data. 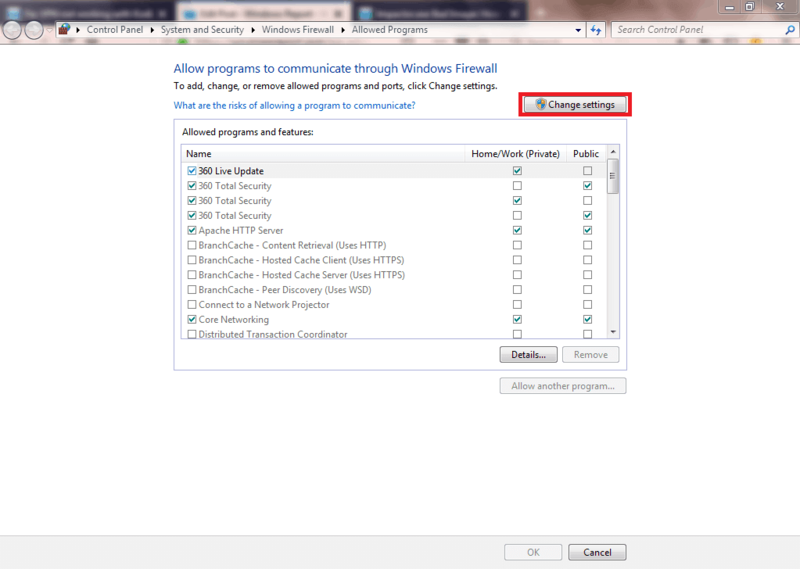 However, it requires Microsoft .NET Framework 7 for its VPN client to work. This VPN never logs any of your information wherever you are, and also has desktop and mobile apps for any and all devices, with access to more than 1000 servers in 26 locations on up to 5 devices simultaneously. In conclusion, the solutions listed above should fix the VPN not working with Windows 7 problem. However, if the problem still persists, you may consider contacting your VPN provider’s customer support center to help you fix the issue. Alternatively, you may upgrade your Windows 7 OS to Windows 10 for technical upgrade and capability which would make connecting your VPN with your PC an easy task. We do appreciate your comment. Let us know if any of these solutions helped fix the VPN not working with Windows 7 OS problem, by leaving a comment in the section below.